Teachers have a part in every educational journey. They nourish students with knowledge garnished with life lessons. As I am one of the beneficiaries of education, I can say with confidence that I would not have matured without the presence of teachers. For me, each educational journey is like a marathon. It looks as though it is an individual sport. Yet, it takes a team: runners cannot run without help from trainers, parents, fans, and sponsors. It’s all combined. Likewise, pursuing education is a collective effort. Parents provide their students with a stable environment in which students thrive. Textbooks help introduce new knowledge to students. Teachers are most vital. They help students navigate through new information, make connections, and develop their thinking. I have had a plethora of episodes where teachers played crucial roles in my life. In elementary school, my teacher tenaciously lectured me on the joy of cleaning desks. Now, I find solace in cleaning my room, which helps me relieve stress during finals. In middle school, my ESL (English as a Second Language) teacher gave me a piece of advice, “Learning a new language takes time, be patient.” Having been patient for 6 years and steadily learning English, I am now writing this blog in English. My high school mentor taught me about the art of giving. Being inspired, I have started to work as a tutor in college to help other students. Now, with this diverse life advice, I have a goal to start projects in order to help alleviate educational inequality through entrepreneurship. Throughout my career as a student, many teachers have gifted me with knowledge and assisted me as I grow into a mature individual. They showed me how to conquer various life challenges, whether it be cleaning, learning English, or identifying my future path. Amidst of the marathon which I am getting closer to the goal, I could not have gotten here without teachers. Thank you, teachers, for joining my marathon team and educating me to run through the academic avenue as well as life. Until I can shout, “We did it,” at commencement, I look forward to further learning from you and growing exponentially. 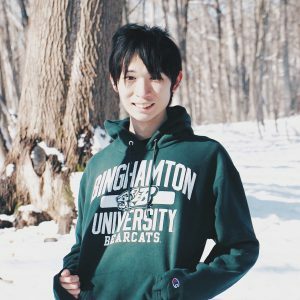 Daiki Yoshioka is an international student from Japan. Currently he is a senior at Binghamton University studying Comparative Literature and Philosophy. On campus, he works as a peer tutor at the Writing Initiative. 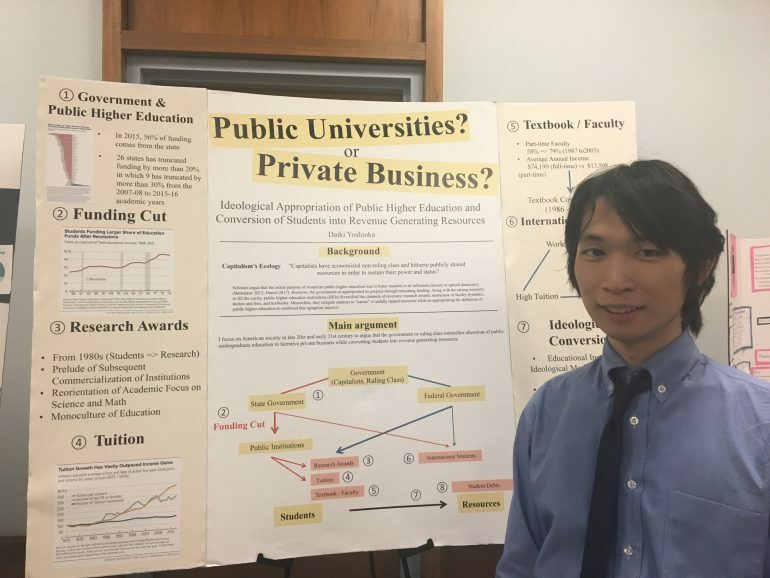 He serves as one of three Undergraduate Representatives of the State University of New York (SUNY) Student Assembly, representing Binghamton University, University at Buffalo, and Upstate Medical University. He is passionate about educational inequality and aspires to launch a business to address the issue.